NOTE: When viewing from a tablet, view in Landscape. Either replacement or pre September 2018 members who wish to have a membership card. All memberships now come with them as standard. One size only. Approx 70mm x 12mm. Excellent quality, beautifully fine detail, our official KT-UK woven Gents tie. Excellent quality, our official Ladies, beautiful woven, finest detail scarf. Size approx L 133cm x w 24cm. Quality mix of tarnish proof, stainless steel and enamel with gold vacuum plating, to ensure a longer lasting finish. Please specify your size via our "contact us" tab. Our Official KT-UK dress badge, can be the ideal answer for those occasions when more formal dress is required. At size approx. 2cm x 2.5cm (width x height) it is discreet, yet noticable. A high quality beautiful badge to wear. Our popular woven iron on patch. Ideal on blazer pockets, t-shirts, jumpers, polo shirts etc. Even looks good on beanie hats. Size approx. 9.5cm x 10cm (width x height). Ideal and versatile to put on your favourite items of clothing. Popular on T-shirts, polos even looks good on canvas bags and beanie hats etc. Beautifully printed A4 print of our codes & oaths. Printed on an A4 "scroll" embossed with our official stamp. 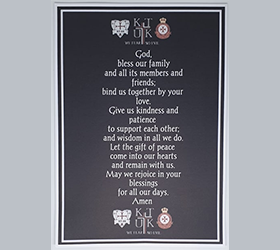 Beautiful KT-UK Prayer printed on quality 210gsm card. Size aprrox. 15cm x 6cm (width x height). Gold colour metal stylus KT-UK pen, in a beautiful presentation box. Presentation box comes disassembled to save on postage. One side is our KT-UK Logo, on the reverse side is our Dress Badge, in addition two of our coasters. KT-UK official printed 5 panel logo cap. An excellent way to show off your allegiance to Knights Templar UK. Fly the flag! There's no finer way to be proud and show others who we are, than with the official KT-UK flag. Pole not included. Made of long lasting mixed material, the size is 5' x 3' (feet) Large. Fly the flag! There's no finer way to be proud and show others who we are. Our two sided printed pennant flag. Excellent quality. Made from long lasting mixed materials. Our shield wall plaque. Approx H18cm W15cm. With a sturdy hook for hanging on the reverse. Can be personalised with name and / or rank. Please email us via the contact us button on our website to inform us of what name you require . Our logo wall plaque. Approx H18cm W15cm. With a sturdy hook for hanging on the reverse. Can be personalised with name and / or rank. Please email us via the contact us button on our website to inform us of what name you require.